I first heard about Taquería Itacate on BlogTO. 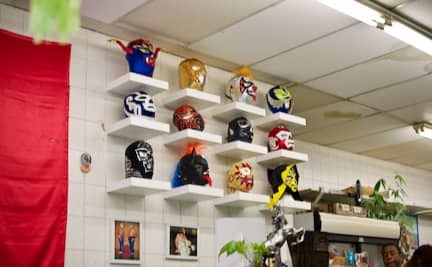 It appears on their “Best Mexican Restaurants in Toronto” list, as well as their list of “Best Tacos in Toronto.” The recurring theme among many of the online reviews of this place is authenticity. A small, family-run establishment, Taquería Itacate shares space with a butcher shop on St. Clair West, so it’s very easy to miss unless you’re actually looking for it. I pass by it all the time but had never paid it a visit until recently, because they only accept cash, and who carries cash these days? Their menu boards are all in a single-size Times New Roman font with titles and descriptions all blending together, so even if you’re normally decisive, figuring out what to order is a challenge. It turns out, they also have take-out menus next to the cash register, which have the exact same prices and information but slightly better formatted, so I would suggest grabbing one of those menus instead of trying to decipher their overhead menu. On Friday and Saturday nights from 10:30pm to 4:00am, they have a special midnight menu of sandwiches that start at $13 each all the way up to $26 for the Torta Itacate, which I’m told has six different kinds of meat, along with a slew of other toppings! I’m looking forward to trying a torta there one of these nights. There isn’t much seating, but it seems like most people order their food to-go anyways. 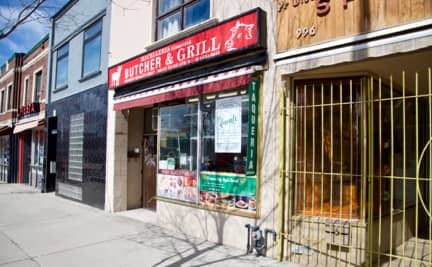 On my second visit (with my wife, Michelle), we sat beside the cash register, right in front of their grill so we got to see them cook while we ate. It was a revolving door of customers that never stopped — in fact, we even had people waiting in line for our seats, otherwise, we could have sat there for hours. It’s a cozy, laid-back environment; very friendly people. The tacos ($6) all come with a double tortilla and a generous portion of meat. The Fish Taco (grilled fish, lettuce, tomato) was our least favourite of their tacos; the Pastor was very flavourful but dry; the Lengua (cow tongue) was surprisingly tender; and the Carnitas, as you can see from the photos, was by far my favourite. So good! The portions are so large that three tacos is more than enough to leave feeling full. Michelle was a big fan of the super-crunchy Fried Chicharron Quesadilla (pork rind in red sauce, lettuce and cheese — $8) while I couldn’t get enough of the spicy Choriqueso Taco. Who would have thought that sausage could be that delicious? Much better than I expected. We’ll definitely be back for the Choriqueso and Carnitas tacos. As you’d expect from such a small place, their menu isn’t very large, but even still, they do have many more items that we want to go back to try. (Flautas, tamales, chilaquiles, more tacos, the midnight torta menu, etc.) They also feature a special soup on Sundays which looked mouthwateringly exquisite. Taquería Itacate was published by Daniel Menjívar on March 26, 2019 at 12:00:57 PM EDT and last updated on April 18, 2019 at 4:41:40 PM UTC .